Obsdale Primary School classes nursery - P4 are currently having a great time each week with Carrie Afrin, one of our music specialists. Using the school's Pupil Equity Funding, our music sessions will help children develop their musical, creative, literacy and social skills during three terms of the school year. 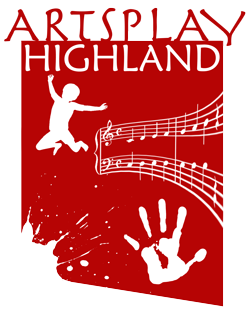 Please contact Artsplay Highland for details on how we can help the children in your school, using your PEF and other funding. Artsplay Highland delivers training and educational workshops and interactive projects in the Inverness & Nairn area and beyond. We deliver training days to carers and teachers. We go into the groups they work with and we work directly with children. The groups put on performances and exhibitions once our projects have finished. We have done many different projects across all the art forms, working in collaboration with artists, crafts people and performers. Our earlier projects are listed on the projects Since 2003 page and on individual pages on the Other Projects menu above.